© 2012 by Kelly Smith; All rights reserved; content may not be copied, rewritten, or republished without written permission. Many towns are still small enough that you can walk up to the average home and go right through the front door because it isnt locked. But in urban settings, where most people dont know their next-door neighbors, much less the folks living down the street or shopping at the grocery store, the potential for break-ins, robberies, and violent crimes is a bit higher, necessitating a more safety-conscious attitude. If you dont want a stranger walking in unannounced and making off with your laptop and silverware, you need to put some thought into home security. And while some people are comfortable with nothing more than a deadbolt, others would hire a security guard and stockpile a virtual armory of heavy weapons if they could afford it. One can laugh at preppers, but when TSHTF they are prepared. However, most of us fall somewhere in between, which is where security systems enter the picture. And some are easy enough to install on your own. Whichever category you fall into, the case for home security and family protection is a given. Should You Hire a Security Installation Firm? There are a few things youll certainly want to consider before you go ahead and install your own alarm and/or surveillance camera system. Most people elect to rig up their own security system for a couple of reasons. For one thing, it is way less expensive than paying someone else to do it for you since you select the system at the price point you prefer and then avoid the cost of labor by doing it yourself. Plus, self-installed security systems arent generally that difficult to hook up (unless youre trying to do something complex like include a closed-circuit system of hidden surveillance cameras, for example). And considering that you can also hire the services of a company that will monitor your existing alarm system in order to call in authorities in the event of a breach, theres no real reason not to install home security yourself. However, its not as simple as snapping your fingers or wiggling your nose; it will take some work to get your system installed. Youll first have to select the type of alarm system you want, and there are all kinds of options with varying levels of cost and complexity. The first thing to consider is what you want your alarm to do. If you simply want a deterrent, you can get a system that sets off a siren loud enough to wake all the neighbors. One viable alternative on the market today is SimpliSafe. Their system is affordable and scalable; you buy only the components you need. DIY installation is very easy and it works on WiFi so even if the bad guys cut your power, the system still works. Or you can install a silent alarm that sends alerts to your cell phone, and the police, as a way to catch criminals in the act of breaking and entering. If youre really handy you might even put in a smart-home system that lets you control the alarm, thermostat, lights, and even household electronics from your computer or mobile device (smartphone, tablet, etc.). Of course, you need to be honest about your skill and experience in this area. Although every system will come with installation instructions, you might need at least a modest base of knowledge concerning electrical systems in order to ensure that your alarm works flawlessly. But as stated previously, with a SimpliSafe system, the electrical system issue is eliminated. And if you want to go a step further and hide cables you might need some carpentry and finishing skills, as well (although there are plenty of wireless systems on the market these days to consider). A visit to your local hardware store or a security system website should give you most of the answers you need. And if all else fails in this DIY venture, you could always hire an electrician or an alarm company to install your alarm setup as a last resort. Of these two choices, wireless is the best choice in most cases. 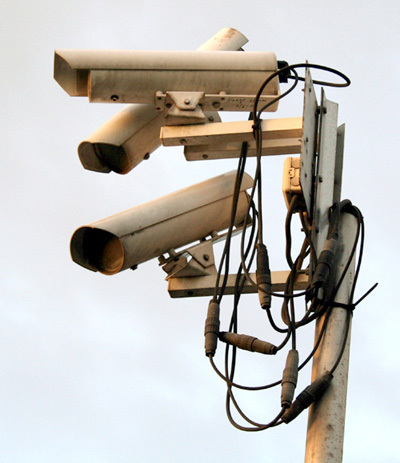 When installing a hard-wired camera, care must be taken to conceal the wires or crooks will just cut them or pull them down. With a wireless camera, this isnt an issue. Also, obviously installation is easier. All you really need is access to your wireless router and you can view the exterior of your home on your computer. The camera should come ready to mount. A dome unit mounts on a horizontal surface and a bullet unit mounts on a vertical surface. Choose the one that best suits your situation. Most people mount them outside their front door aimed towards the driveway. Install a Camera Peephole. Most entry doors dont come with a peephole and the standard ones are really junk. For about a hundred dollars you can get a decent camera-equipped one or you can go all-out and get one that also has an intercom. Upgrade Your Mailbox. Face it; people are so trusting. We get mail all the time that contains sensitive information. Even those pesky credit card offers are ripe for identity theft. Invest in a mailbox with a lock. Always Lock Your Cars and Use a Club on the Steering Wheel. Recently there has been a rash of car invasions in the wee hours. Camera footage shows the culprits to be teenagers who look for unlocked cars to ransack; locked ones are passed over. You can buy a "club" at Walmart to put on your steering wheel. Even if they hot-wire the ignition, they cant turn the steering wheel to drive the car. Invest in a Safe or Two. Sure, a crook can carry off a safe but they can be secured down to make it very difficult and time-consuming. Safes are like fire extinguishers, inexpensive but a God-send when you need them. I personally have one for firearms, one for ammo, and one for valuables. Beef Up Your Entry Door Jambs. Remove all those tiny useless screws on your entry doors and replace them with long ones that go not just into the jamb, but through the rough opening into the studs. 3 to 4 inch long stainless steel or brass screws should do it. You might want to pre-drill the holes and rub some bath soap on the screw threads so you wont strip the screws during installation. Get a Dog or Two. This tip speaks for itself. Crooks would rather not tangle with a territorial dog, plus they make excellent warning systems. Woof. rescue dogs are a great option.